Peter Miller (1939-2014) was an automotive fine artist par excellence. He once said this about art: “It takes over your life, but makes life worthwhile. Real painting comes out of love; everything else is unimportant." Despite this exposure and award for his extraordinary work, this modest artist remained little known in the automotive art world. Notable artists now laud his stylish work when shown: “A unique and lovely style.” "Nothing short of glorious.” “Really beautiful style.” “Fantastic!” Miller’s trustees have entrusted Car Art to help bring his automotive art to a global audience online, giving it the wider recognition he deserved. Peter “had a long ambition to own a Rolls-Royce,” which he fulfilled in 1964 when only 25 years of age: a 1929 fabric-bodied 20/25. “I always had a passion for old ‘odd’ cars. Big creaking Austins, a beautiful SS Jaguar, Rileys, MGs and Alvis.” Other Rolls-Royces were bought and sold over time: three from the 1930s as well as a 1949 Silver Wraith. 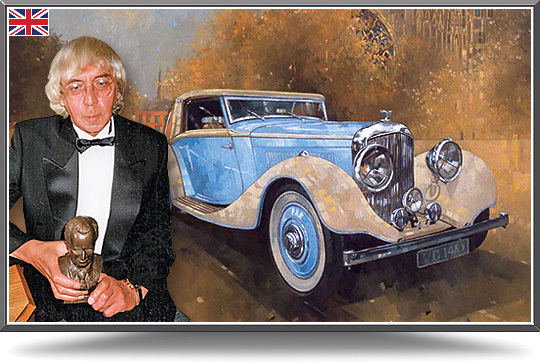 His personal affection for Rolls-Royces and Bentleys of the 1920s and 1930s inevitably led to artistic portrayal. From 1992, Miller became inspired to capture the Golden Era that these magnificent cars personified. Their coachwork epitomized the grace and elegance of the inter-war period in England. He went on to complete over 650 paintings of these legendary marques that built the best cars in the world. Miller sought to evoke a mood, a sense of time and place, and let pictorial elements speak for themselves. Working with passion and intensity, he aimed to create wonderful themes; not merely pictures of cars. Nevertheless, the cars are typically rendered in detail and the backgrounds more impressionistic, with tones of color sepia and sometimes splashes of the vehicle's color. Check this page in the months to come if you wish to see Miller's original paintings, or call Peter Aylett at +949-443-0500 for details.